Her legions strode forth from the centre of civilization - west to Britannia, east to Asia, north to Germania, south of Aegyptus - and conquered most of the known world. In their travels the legions found things that would be disbelieved by slave, citizen, and senator alike. War elephants, wild dervishes, and creatures beyond description met them at every turn. The glory of the Empire spread to the corners of the earth, but its shadow found even darker places - and things - that defied record. Join the forces of Rome and battle through the ages against her enemies. Discover the terrible secrets left out of the history books. Save the empire. Save your shieldmates. Save the world. 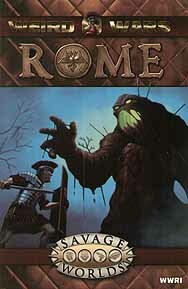 Weird Wars Rome requires the Savage Worlds core rules to play.